It’s thrilling, it gives you that kick and it is unapologetically Badass! We are talking about the trailer of NH 10 starring Anushka Sharma, Neil Bhoopalam and Darshan Kumaar. Judging from the film’s trailer, the storyline seems to be extremely fresh and engaging. It’s dark; it’s dirty and sees the characters surviving against very violent situations. Darshan Kumaar looks extremely impressive as a badass goon (or whatever it is that he is playing). After playing the matured, supportive husband in Mary Kom, Darshan pleasantly surprised us in this trailer. This man definitely has the potential to make it big provided he picks the right films in the future. Also, since Anurag Kashyap and Vikramaditya Motwane are on the producers list, we know that it is quite a win-win situation for the film and Anushka in particular. Although, a lot of fans have found a striking resemblance of the film’s trailer and story to Hollywood films like I spit on your grave and The Hitcher. Well, it’s too early to say anything for now. Even if the story is inspired from somewhere, but if the execution is appealing and the narrative style engaging, we are sure the film will get a lot of viewers. Anushka, who plays the lead in this film, has also produced it. Wow! The film must be something great since she agreed to pitch in her money. Personally, we are eagerly waiting for the 6th of March when the mystery will unveil. It seems like a couple’s trip gone ridiculously wrong and if they manage to survive that or not. The trailer definitely gives a lot of hints on honour killing. This could be Anushka’s ticket to offering something new to her fans with this role. We have also heard that the film is under the scanner by the film federation for it’s adult content and constant abuses. This could be critical in deciding the fate of this film. As usual the film’s team has justified it by calling it an important part of the films storyline. It all now depends on what certificate the film receives and if the censor board finds the need to cut out certain scenes from the film. The trailer is receiving a lot of critical acclaim and love for it’s “never before explored” bold subject and performances. This could be Anushka’s second consecutive hit after Pk and that could directly put her back in the game. She is already doing a film with Zoya Akhtar and therefore has a lot to offer her fans in terms of diversity in the characters that she will be playing on screen this years. The film could be an iconic example in presenting “girl power” if it has a strong script. 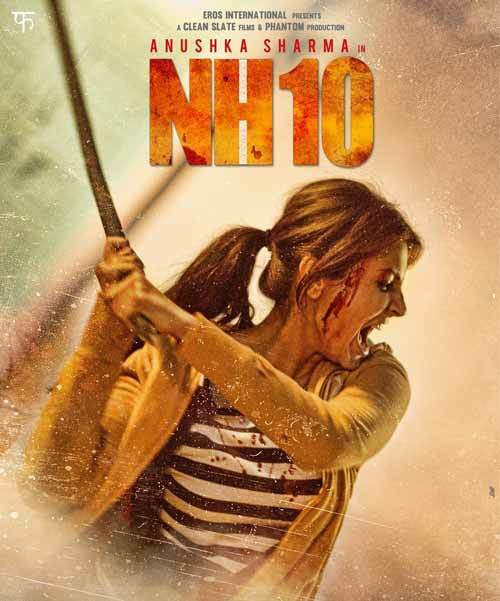 Here’s wishing team NH10 all the best. What did you think of the trailer? Share in comments. P.S: Do you think this could be Anushka’s way of telling directors that she can do a lot better apart from playing a bubbly Punjabi girl? We think so. Next articleTHE ROAST THAT WAS!